When Master Vampire Lucien Delgatto threatens her potential mate Wick’s life, Shape Shifter Andrea “Andy” McNeilly will employ a den of witches, a bedazzled thong, and her ability to shift into multiple animals to meet his demands. She plans to keep Wick safe—even if she’s not speaking to him. Lucien’s unwelcomed control over Wick's life has thrown Andy into a whirlwind of emotions. 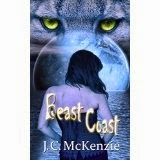 Thanks for sharing this with us, J.C., and good luck with Beast Coast.